Councillors have begun to present their case for a second harbour crossing in Poole - the Twin Sails Bridge - at a public inquiry, which began on Tuesday. The hearing, expected to last four weeks, will hear evidence for and against the bridge, which the borough council hopes will cut heavy traffic. The planning inspector will then take three months to file a report with the Department of Transport. A final decision is not expected until summer 2006 at the earliest. Since the need for a public inquiry was announced in February, councillors have been working closely with objectors to try to address concerns, a council spokesperson said. Cllr Ron Parker said: "The inquiry certainly represents the biggest challenge so far in this process but we have never been closer to achieving the dream of a second bridge for Poole. "The public inquiry was always expected in the process and the council has been working extremely hard to satisfy any concerns raised. "We are confident that the town's case for the Twin Sails Bridge is strong and that all concerns raised regarding safety and the operation of a two lifting bridge system can be met." 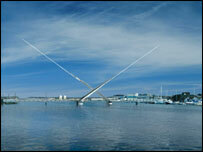 If it gets the go-ahead, it is thought the bridge will be completed by 2008 or 2009.